Do you have photos, historical accounts or other items pertaining to the Dodge Center area? Would you like to share this historical information with the world? LakesnWoods.com would like to publish your Dodge Center photos (current or historical) or historical accounts on this website. Original materials can be returned and your privacy will be respected. Dodge Center, a Minnesota Star City, is "Stepping Toward the Future".There are over 100 retail, service, manufacturing, and professional businesses that call Dodge Center their home and work together with their agricultural counterparts in our rural environment. The businesses draw from a well-educated labor pool and enjoy their Greater Minnesota location combined with easy access to the Minnesota urban centers of Rochester, Owatonna, Minneapolis/St. Paul, and other Midwest metropolitan areas. Dodge Center's quality of life is second to none. 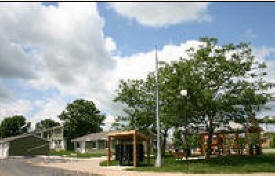 The community work ethic is strong as residents dedicated to their goals pursue economic and personal satisfaction. We are proud of our city and its growth and expect to continue seeing good things happen for us in the future. 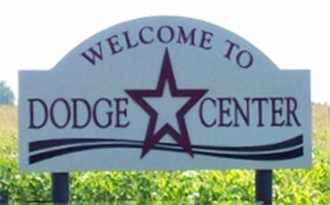 Dodge Center welcomes all to our "Better Place to Live". 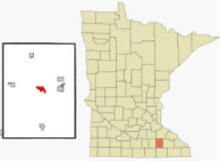 Dodge Center is a city in Dodge County, Minnesota. 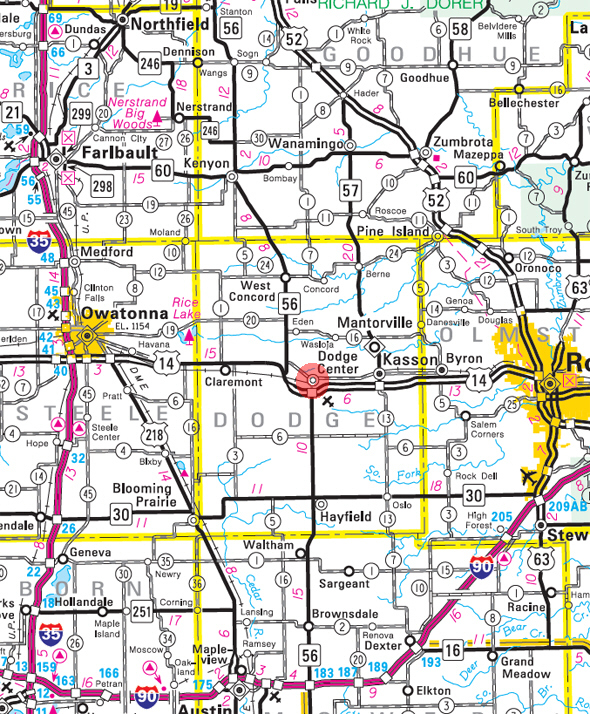 U.S. Route 14 and Minnesota State Highway 56 are two of the main arterial routes in the city. 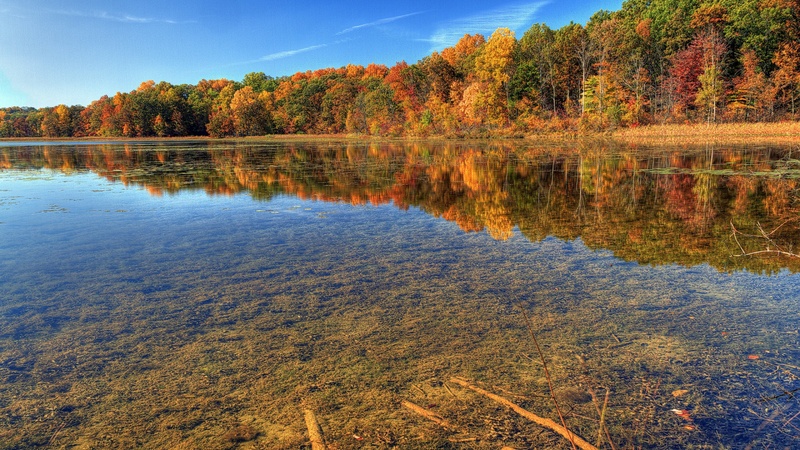 According to the United States Census Bureau, the city has a total area of 2.08 square miles (5.39 km2), all of it land. The elevation is 1,293 ft (394 m). DODGE CENTER, a city of Wasioja Township, sections 33 and 34, founded in 1866, was platted in July 1869, and was incorporated February 29, 1872. This name was proposed by D. C. Fairbank on account of the location at the center of the county. A bill was submitted to the legislature in 1870 requesting the name be changed to Silas; however the bill was tabled, and the name remained. 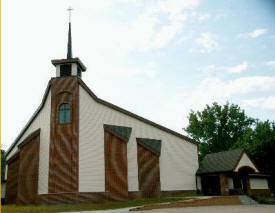 The city was reincorporated on June 7, 1907, and separated from the township on March 19, 1918. 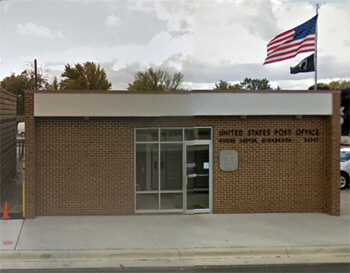 The post office was established in 1867. The first passenger train arrived here on the Winona and St. Peter Railroad, July 13, 1866; it had a station of the Chicago Great Western Railroad. The City Council meets the 2nd & 4th Monday of every month at 6:00 pm in Council Chambers at City Hall. The Dodge Country Club is a fantastic mix of scenic views, challenging holes and a relaxed atmosphere that golfers often seek but rarely find. 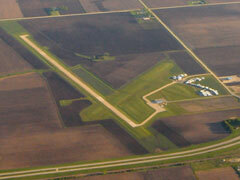 Located on the west side of Dodge Center the Dodge Country Club is just 20 minutes from Rochester off of Highway 14. A full service bar and grill to greet you after your round will ensure that your day of golf is complete. A new 9 holes was added in 2000 and has matured immaculately. The variation between the "old nine" and the "new nine" keeps players guessing. 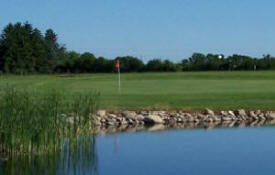 A player's course, the Dodge Country Club, will reward you on good shots and penalize you on those not so good shots. 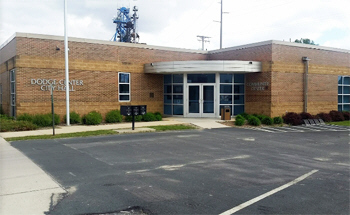 The Center Clinic is a non-profit health care clinic located in Dodge Center, Minnesota. We are committed to providing low-income, uninsured and underinsured women, teens and their partners with quality physical and mental care, as well as counseling and education services. As we continue to grow and expand, more services will become available. The Triton Public School District was incorporated in July 1992, combining the Claremont, Dodge Center, and West Concord School Districts. Weekly newspaper published on Wednesdays with a circulation of 861. Con-Tech Manufacturing is a privately owned business that is dedicated to serving the concrete industry with quality and service. Com-Tech Manufacturing was founded by Daniel Welsh and Grant McNeilus. Daniel Welsh, owner of Welsh Equipment, has become the leader in the used and refurbished concrete mixer market throughout the United States. Grant's father Brandon and Grandfather Garwin were well known leaders in the industry and set standards for today's mixers. 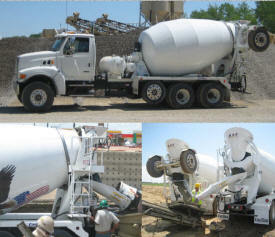 Grant is proud to be serving the concrete industry as well. Con-Tech Manufacturing offers a full line of new mixers, quality replacement parts, glider kits, complete mixer services and good business. Dodge Center Chiropractic is dedicated to serving all of Dodge County with state of the art, neurologically based chiropractic care. Dr. Klein will give you the attention you deserve every time you walk in the door. We always offer complimentary consultations to give you an opportunity to come and discuss your health concerns with Dr. Klein and find out if chiropractic care is the right fit for you. Chiropractors are more than pain doctors. Dr. Klein has extensive training in all of your body’s systems and is an expert in the care and maintenance of the nervous and musculoskeletal systems. For injuries, chronic conditions, and overall health and wellness, chiropractic is an excellent choice. Locally owned and managed, we’re open Monday through Friday 8:30am to 5:30pm. Specializing in investment lines of credit and real estate loans, Equity Bank has the expertise to give you the analytical personalized service you expect and deserve for all your entrepreneurial and investment lending needs! 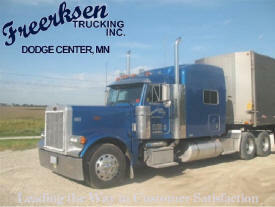 Freerksen Trucking, Inc. is a family owned trucking business that is based in Dodge Center, Minnesota. Freerksen Trucking, Inc. went into business in 1989 and has been a remarkably fast growing company. We have partnerships with over 1000 trucking companies within the United States. We travel to all 48 continental states covering all traffic lanes coast to coast. We have a large trucking fleet that consists of company owned trucks and trailers, and several owner operators under our authority. Greene Doors has been supplying doors, frames and hardware for building projects across southern Minnesota for more than 27 years. We are distributors for Steelcraft hollow metal doors and frames; Special-lite entrance systems; Timely pre-finished frames; wood doors by Algoma, Eggers, Graham , Mohawk and Oshkosh; and finish hardware from Hager, Markar, Yale, Schlage, LCN, Von Duprin, Glynn-Johnson, Rixson, Reese, and Hiawatha to name a few. Kwik Trip, Inc. is owned by the Zietlow family and is unique in the convenience store industry because we maintain total quality control over a wide variety of products by producing and packaging these items in our own state-of-the-art facilities. Welcome to Lowell's Auto Sales located in Dodge Center, Minnesota. Whether you are new to us or a longtime member of the family, we are equally committed to satisfying all your transportation needs. We created this site with you in mind. Strong. Proud. Dedicated. Since 1975, McNeilus Companies has been listening to our customers, providing products and services that changed the way our industries did business. We lead the industry in innovation by staying focused on customers' ever-changing needs, and follow the worldwide benchmark for quality by being registered to the ISO 9001:2008 standard. Driven by a Midwest work ethic punctuated by a competitive spirit, we’re proud of what the McNeilus name stands for. And we’re constantly working to add value to that foundation through the innovative products and services we provide. Computer systems track and inform staff of real time product availability. Mill and lot numbers are displayed with chemistry reports and the latest ASTM steel specifications. This system ensures that McNeilus Steel, Inc. will fulfill your order quickly and accurately. Advanced technology is necessary in any industry. Steel processing is no different. McNeilus Steel, Inc. utilizes coil processing lines featuring stretcher-leveling technology. This equipment, combined with a highly trained staff, exemplifies McNeilus Steel Inc's commitment to supplying material that exceeds customer demands. Metro signs specializes in indoor and outdoor advertising signs for all your business needs. Contact us for all our latest products and prices. National Fleet Graphics was founded in 2001 with the goal of supplying our customers with quality products at a competitive price with a quick turnaround time. We chiefly serve Central Minnesota, Northern Iowa, Western Wisconsin but also serve many other locations as we also travel (or ship product) for our longer distance customers. Profit-Trac Agronomic Services specializes in soil production management and Complete Agronomy Solutions specializes in crop management, financial services and crop insurance offerings. We have partnered our companies to offer an all encompassing crop production package for retailers and growers specializing in quality, expert and ethical production farming advice. Each facet of the package, whether it is being utilized as a complete package or an individual service, has its own personnel that have a high level of training, knowledge and expertise. For nearly 40 years, RDM of Minnesota has been recognized by Fortune 500 companies as well as Start-up manufacturers as one of Minnesota’s most responsive partners in the value of Quality, Delivery and Cost Effective Sourcing. Our services include CNC metal fabrication services and turn-key outcomes from quote to finished goods including the ability to ship directly to our customers point of sale. Sominn has been serving the metal fabrication equipment industry since 1972. We're affiliated with the Machinery Dealers National Association, Machinery Information Systems and The Society of Manufacturing Engineers. We carry new and used equipment including Press Brakes, Benders, Compressors, Brakes, Drills, Grinders, Lathes, Mills, Saws, Welders and lots more. Welsh Equipment, Inc. is the #1 source for used mixer trucks. Welsh Equipment is located in Dodge Center, Minnesota with a second location in Palmetto, Georgia. Welsh sells used mixer trucks, specializing in export sales, and also offers other products and services associated with the ready mix industry. Welsh Equipment, Inc. presently has a large selection of used mixer trucks in stock to choose from! We have mixer trucks arriving and being delivered daily. Between our Minnesota and Georgia location we carry a large selection of almost 300 mixer trucks, all makes and models. Some of which include Advance, Mack, Peterbilt, Oshkosh, Ford, Kenworth, and International used mixer trucks.